H.E. 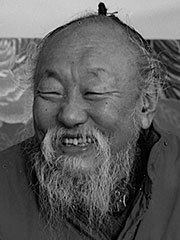 Chagdud Tulku Rinpoche (1930-2002) was a renowned teacher of the Nyingma school of Tibetan Vajrayana Buddhism. H.E. Chagdud Tulku Rinpoche was the fourteenth recognized Chagdud incarnation. Chagdud means “iron knot,” and is said to derive from one Sherab Gyaltsan, the first Chagdud incarnation, who folded an iron sword into a knot with his bare hands. This feat deeply impressed the emperor of Mongolia and inspired him to shower honors on Chagdud. Chagdud Tulku Rinpoche demonstrated the same extraordinary power several times in his youth when he compressed stout swords into folds. Following Tibet’s invasion by China in 1959, Chagdud spent twenty years in India and Nepal working as a doctor and teaching in the refugee camps. In 1979 he traveled to America to establish the Dharma and the Red Tara practice as foretold in a dream. He was responsible for bringing many high Lamas and yogis to the west. In 1995 he settled in Brazil, where he lived until his miraculous death. As well as the original Gonpa in Nyagrong, Eastern Tibet, more than 38 Dharma centers have been established under Chagdud Tulku’s supervision and inspiration, in America, Brazil, Chile, Uruguay, Switzerland and Australia. The best known are Rigzin Ling in Junction City, California and Khadro Ling, his main center in Três Coroas, Brazil. His wife Chagdud Khadro and his son Jigme Tromge Rinpoche continue to teach and carry on Chagdud’s many projects and practices.